An old German saying says that the dumbest farmer produces the biggest potatoes. Today we can say in contrast that the clever farmer harvests solar electricity. 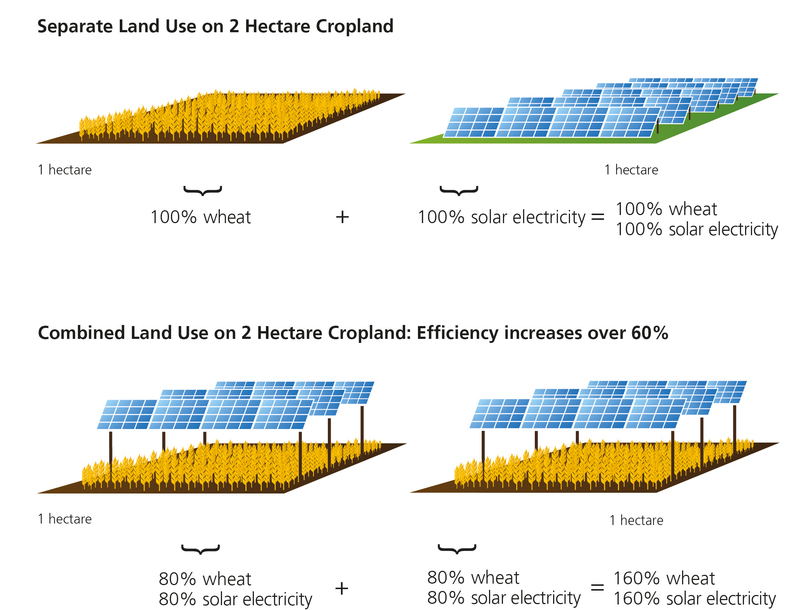 In Germany, solar electricity is about ten times more profitable than growing crops. 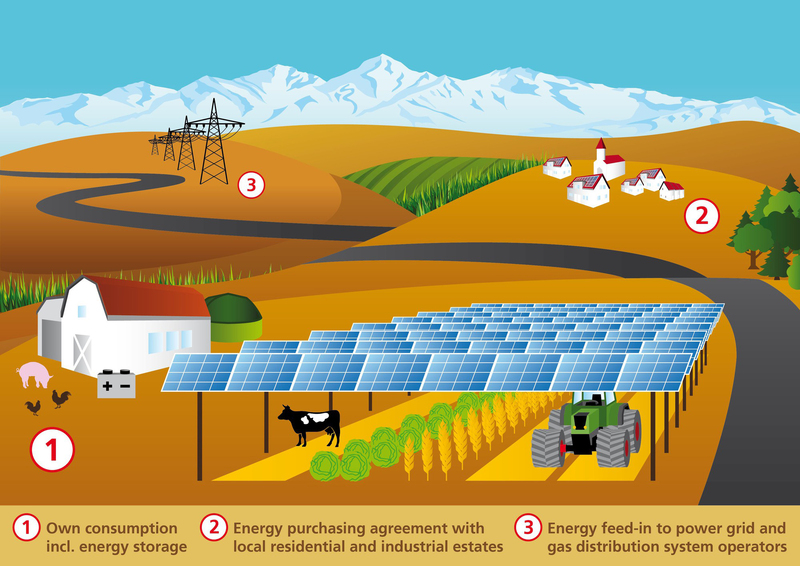 When the first open-space photovoltaic plants were installed on arable land, a hot debate arose: Valuable acreage is being taken from food production and farmers are becoming energy managers. 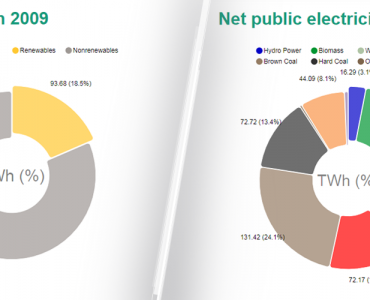 It is true that Germany must open up new land for the production of solar electricity in order to meet the urgent expansion of renewables needed for the energy transformation. Studies show that photovoltaic installations totaling 200 GW are required in order to meet the goal of reducing carbon emissions by 85 % by 2050. Instead of being competitors, photovoltaics and photosynthesis can actually complement each other: Agrophotovoltaic systems make the efficient dual land usage possible: The farmer not only provides potatoes but also electricity – from the same piece of land. 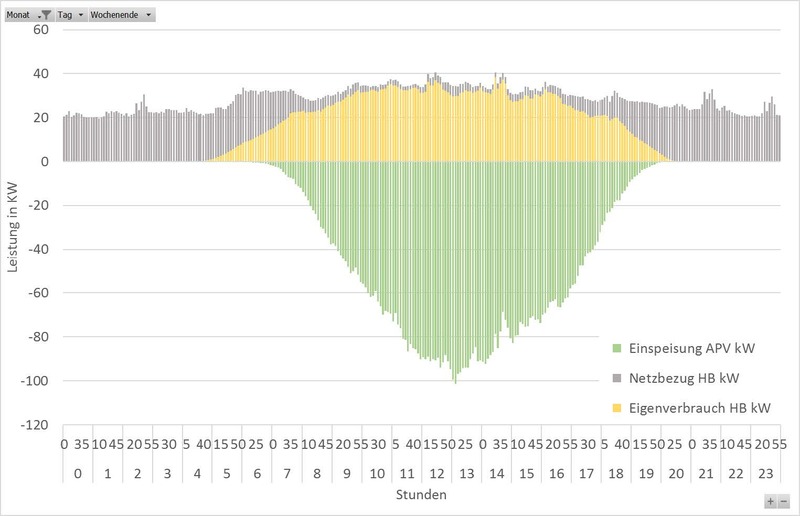 Just how well this works has now been shown by the agrophotovoltaic (APV) plant which has been operating for one year at the Demeter farm community in Heggelbach near Lake Constance. On a test field covering one third of a hectare, organic crops are grown and directly above at a height of five meters, 720 solar photovoltaic modules are harvesting the sun to produce electricity. The rows of semi-transparent glass/glass modules are placed at a larger than normal interval so that the crops growing underneath receive at least 60% of the sunlight needed for photosynthesis. In this way, both power and produce can be harvested on the same piece of land. The seven partners of the model project “Agrophotovoltaics – Resource-Efficient Land Use,” led by Fraunhofer ISE, want to clarify the technical, societal, ecological and economical questions relating to this new application of photovoltaics. For example, they are investigating different crops to determine which grow best underneath the PV modules with the least yield loss. Also under study are the political and energy economical boundary conditions that are required to help the new technology break into the market. From the agricultural science perspective, APV appears, at first sight, to be a promising solution for increasing both the land use efficiency by harvesting crops and electricity on the same field and the renewable energy mix produced on arable land. However, we agree that it is important to gather more experience over the next few years and analyze other crops before drawing up final conclusions. Good Conditions under the PV Modules? 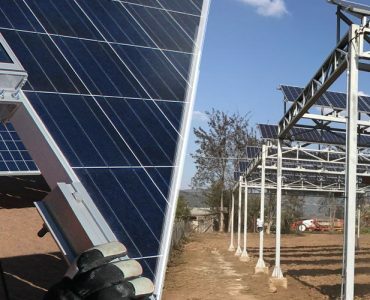 The solar modules shade the crops from the full amount of solar radiation, affecting also the microclimate and water household below the PV array. Therefore, we are investigating the response of the crops to the local changes in environmental conditions. Data on the microclimatic parameters like photosynthetic active radiation (PAR), air and ground temperature as well as precipitation are collected. First analyses indicate that the PAR under the APV system is reduced by about 30 percent. The local air temperatures at the APV system and the reference plot are the same. A more detailed analysis is under way. The four crops under investigation (clover, celery, potatoes and winter wheat) are grown without irrigation. Wash outs have been observed at isolated locations in the field and are dependent on the culture and the stage of development. In particular, the rain collector underneath the modules edge evidences an uneven distribution of rain water. These data are presently being evaluated. While the clover yield was reduced only slightly (-5.3%) due to shading from the APV, the yield decrease for potatoes (-18.2%), wheat (-18.7%) and celeriac (-18.9%) was higher. In the first year, the winter wheat and the potatoes growing under the PV array showed a slightly slower development than the same crops on the reference plot. This difference was visually noticeable on only a few days. At harvest, no mentionable difference in development was observable, so that the crops under the APV and on the reference plot could be harvested at the same time. At present, we are still analyzing this data. Presently, the results from the first year of practice show that all four crops were qualitatively good and marketable. In comparison to the crops from the reference plot, however, a lower yield was evidenced. We would like to point out that both plots were harvested at the same time, which was a bit too early for some of the plants under the APV array. Normally the potatoes and celeriac should have been given about two more weeks to ripen. The results on the yield quality are still open. Statements about alternative, eventually more suitable, plants cannot be made yet. Before this is done, further investigations with other crops are necessary. Based on the low yield losses, clover grass crops grown under APV systems show the most promise to date. Before final conclusions can be drawn, however, we must wait for the results from the second year’s harvest. Another experimental test in the practice shall demonstrate whether grazing livestock under an APV system is viable. The combination of livestock and APV is not the focus of the APV-Resola project. It is currently still unclear to what extent APV affects the yield quality and nutritive value of the plant, and we are waiting for the final laboratory results. We also can say little about the performance of APV in other climate zones, due to lack of appropriate data. Further field trials in specific climates would be helpful here. The project results from the first year are a complete success. The agrophotovoltaic plant has proven to be suitable in the practice with costs equivalent to a small PV roof system. Also, crop yield is only slightly lower compared to the yield from the equivalent reference area. In all, the land use efficiency increased by 60 percent. We exceeded our expectations, at least with respect to the technical requirements. In the first twelve months of operation, the PV plant produced 245,666 kWh of electricity, or 1266 kWh per installed kW power. This power output is one third higher than the German average of 950 kWh per kW. Baywa renewable energies GmbH, responsible for the construction and load management of the APV system, evaluated the self-consumption. Over the day, the power produced by the APV system was well matched to the power consumption on the Demeter farm. In the summer months, the load demand was covered almost fully by the APV system and in July close to one hundred percent. While the system provided the necessary electricity often too late in the winter, the provision in the summer was sufficiently early. About 40 percent of the produced solar power was directly used on the farm community in Heggelbach for recharging electric vehicles as processing the products. The Demeter farmers with Thomas Schmid are planning to increase their self-consumption to 70 percent by optimizing their consumption behavior and installing electric storage. As of now, load peaks of 50 or 100 kW cannot be met by the APV system. The surplus electricity is fed to the electricity supplier and project partner Electrizitätswerke Schönau. In general, the additional economic yield per unit area is difficult to quantify. For farmers in Germany, energy production is about ten times more beneficial economically than food production. This presents, however, an ethical dilemma: We are using valuable, arable land to produce energy (18 percent of arable land in Germany is used for growing energy crops) and at the same time we are importing food from threshold and developing countries. As a result, these countries grow crops for export and less food is available for the indigenous population. This is not in the interest of climate protection. The life cycle analysis of the APV plant will be completed at the end of 2018 so we still have no final results on the added ecological benefit of the system. To date, no negative ecological benefits have been identified. On the contrary, the biodiversity existing before installing the plant is still the same today. A conventional open space system would have affected the biodiversity, and at the same time no food crops would have been able to grow on the land. Since the founder of Fraunhofer ISE, Prof. Dr. Adolf Goetzberger, conceived of agrophotovoltaics in 1981, numerous large agrophotovoltaic systems have been installed worldwide. On the other hand, only a few research plants exist. In the project “Agrophotovoltaic Resource-Efficient Land Use”, the technical, societal, ecological and economical aspects of the technology are being investigated in the practice on a pilot demonstration plant. The project goal is to develop the APV open space technology to a marketable product. In order to provide the necessary proof-of-concept before market entry, we must still compare other techno-economic APV applications and realize larger systems, for example, on the order of 3 MW. Different possible applications shall be explored, for example, in combination with fruit, berries, hops and wine crops as well as the combination with the various technologies such as energy storage, special films with organic solar cells and solar PV water treatment systems. A future vision is “swarm farming,” whereby automated solar-powered electric farm machines are working under the APV array and receive their power directly from the APV system. Already today, machines exist that autonomously cut weeds or eliminate pests such as the Colorado potato beetle without the use of chemicals, polluting the ground water or the soil. In this way, farming becomes more sustainable not only with environmentally friendly machines but also through intelligent technology. Another research focus addresses the transfer of APV technology to other climate zones. The technology of dual use may prove to be especially advantageous in semi-arid threshold and developing countries. APV systems provide not only shading for crops and livestock (not to mention reducing the water demand), but also supply electricity that can be used for water treatment and water provision. This may help curb the trend to desertification and deterioration of the soil quality. Another additional use is providing electricity for villages located far from the grid. Here the village population can use the electricity to process or cool the agricultural products, gain access to information, education, improve healthcare (cooling of vaccinations and medicine, night operations). An APV plant offers an additional form of income without taking away the valuable agricultural land needed for crop growth. 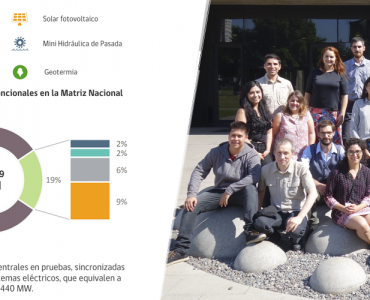 Along these lines, Fraunhofer ISE scientists are consultants in the project “AgroPV-Chile” in which the Fraunhofer Chile Research – Center for Solar Energy Technologies FCR-CSET is installing three APV systems in three different climate regions around Santiago de Chile. The project goal is to test the interaction between different crops and climate regions for the APV technology. Fraunhofer ISE is supporting the Fraunhofer CSET in the construction phase, the communication with financial sponsors, publicity as well as with the development of a suitable mounting structure for the PV modules. In order that APV has a chance on the market, further research and investment from industry is required. Also, however, appropriate political support as for other renewable technologies is also necessary. 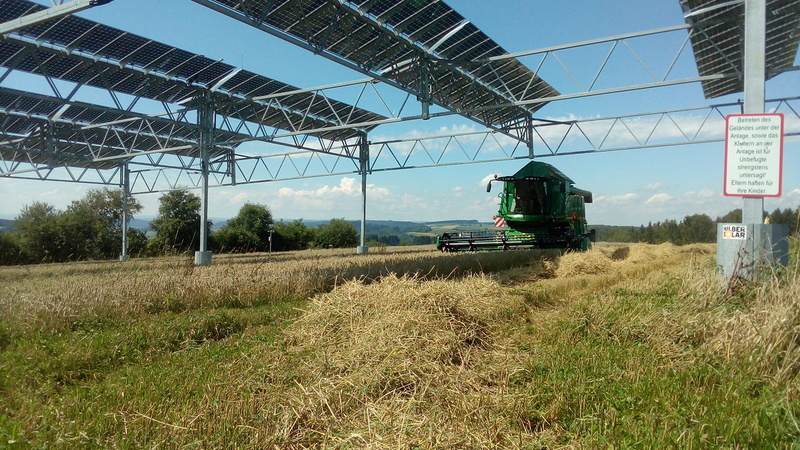 Fraunhofer ISE and the Wuppertal Institute have made a joint statement, with support from the University of Hohenheim, proposing that agrophotovoltaics be considered separately in invitations for tender while in the test phase. Then the saying in future will be: The clever farmer harvests both solar electricity and potatoes. Stephan Schindele is Diplom-Betriebswirt. He is working on his doctoral degree about the innovation processes of agrophotovoltaics and their political support. He is project manager of Agrophotovoltaics at Fraunhofer ISE. Prof. Petra Högy works at the Department of Agricultural Science at the University of Hohenheim in Plant Ecology and Ecotoxicology. Among other topics, she focuses on the effects of climate change on agricultural ecosystems.